At the beginning of the issue, Beast discovers that the Terrigen Mist, the force used by the Inhumans to generate their powers, has dangerous side affects for mutants. Not only that – get ready for it – Beast reveals that the mutants have two weeks before the Terrigen Mists will render the planet uninhabitable for mutants. Debates rage within the X-Men factions, a legion of characters Storm, Beast, Emma Frost, Logan, Magneto and others discuss their best options for combating this menace. In the end Magneto and Emma Frost decide that offense is the best form of defense. Magneto manages to convince some of the x-men to remove both the Inhumans Royal Family and the Terrigen Mist cloud once for all. Beast remains opposed to this course of action and is not pleased that this agreement was negotiated without his consent. But, the conflict between the X-Men and Inhumans breaks out anyway, with some visually pleasing fight sequences. The audience is now in pole position for the remaining episodes in the six issue mini-series. For comic fans following the recent X-Men issues don’t worry there are sufficient explanations burred within to wrap up loose ends. The art work by Leinil Yu, who provides pencils, manages to create an amazing amount of detail into every frame, even the complicated scenes are finely drawn with the minutiae very vivid. The sequences where X-Men and Inhumans engage are particularly well conceived and entertaining. It’s great to watch the super abilities of these characters being deployed to such eye-catching extent. The other artists in this collaboration Gerry Alangulan (inker) and David Curielon (colors) are also producing some fine work. 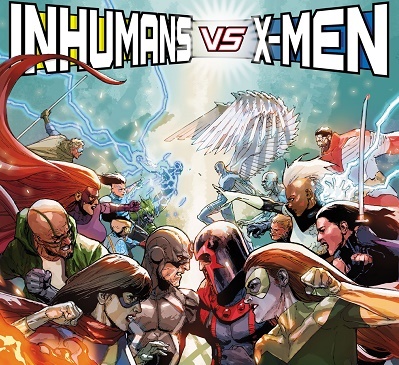 Inhumans Vs X-Men #1 was released on December 14th, with six issues in total planned for the mini-series.